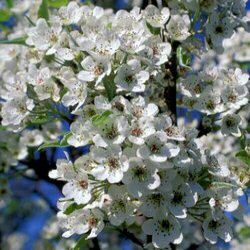 Chanticleer (Pyrus calleryana 'Chanticleer') is a slender ornamental pear which is covered in masses of pearly white flowers during springtime. These are followed by round brown coloured pears, but do please note not edible pears. Please see our pear fruit tree range for edible pears. Its glossy, dark-green coloured leaves change to delightful hues of magenta and crimson during autumn and commonly remin on the tree into winter. Tolerant of pollution and alkanine soils, because this tree only reaches a height of 6m (20ft), it is a good choice for a small urban garden. Chanticleer a height of between 1.5 and 2.40 metres in a 7-12L container, which means that the tree has an already established root system and therefore this tree can be planted any time of the year and with better results than either bare-root or rootballed trees. 150-200 cm : Usually delivered in a 5-12 litre container and 2-3 years old.